The LEAD and LAG windows functions were introduced in SQL Server 2012 and have added functionality that would previously have been achieved with a self join. LEAD and LAG allow you to use values from a previous (or following) row in a resultset. You can use this, for instance, to calculate the difference between the current and previous value of a column. The order of the rows is determined using the 'OVER' clause, so how the previous or following rows are selected can be defined, which typically might be based on a date or ID column. You can also specify an offset to step forwards or backwards by more than one row (the default is one). By way of example I'll set up a table containing share price values by date, and use the LAG function to obtain the share price for the previous day. This is then used to calculate the day by day change in share price. 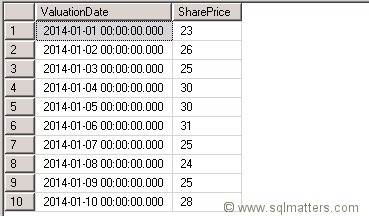 The following SQL will return both columns in the table, along with two new values, for yesterday's share price and the increase (or decrease) in the share price since yesterday. As you can see the value of 'YesterdaysSharePrice' is copied from the 'SharePrice' column from the previous day as indicated in the image above. The LEAD and LAG functions also include a PARTITION BY clause which mean that the functions can be used on subsets of the data in a record set. I won’t demonstrate that here but it is useful if you want to calculate the LEAD and LAG values on a subset of the data split by some criteria. For instance in the example above if the table contained daily share prices of more than one company (perhaps using a CompanyID column), the data could be partitioned by CompanyID, to show the daily difference in share price for each company. I have also prepared one article about, New LEAD() and LAG() analytics function of SQL Server 2012.